Such Designs is a family run business, with over a decade experience in Bathrooms and Kitchens. Born out of a need to create quality, style, simplicity all at an affordable price. At Such Designs we sell only the very best in modern and traditional bathroom and kitchen furniture. Working with only the finest industry brands to enrich our customers lives from Miele to Eggersmann, Rotpunkt to Gaggenau. Our knowledgeable staff are available between the hours of 9am - 5pm Monday to Friday and 10am - 3pm on Saturday. We set high standards in ensuring world class service. So, why don't you visit our showroom and give some of our working appliances a test drive. Looking for the complete relaxation experience? As the world’s leading provider of sanitary fittings, it is our passion to deliver you unrivalled water enjoyment. Including a full range of showers, bath taps, basin mixers and bathroom accessories. GROHE is dedicated to providing you with bathroom and kitchen solutions that will help you create your dream home. Immerse yourself in the fascinating world of water enjoyment! Our innovative water products can be experienced through numerous high-profile projects around the globe such as the Sheraton Grand London Park Lane, the Kempinski Cathedral Square in Vilnius or the Sustainable City in Dubai. Likewise, we have numerous designs that can be used at home to make a space that reflects your lifestyle and matches your desired style. Bearing the badge “Made in Germany” its our priority to offer you the highest quality. As a customer you benefit from German-engineering knowledge combined with high-class designs. Additionally, our perfect functionality gives you the opportunity to enjoy our products while ensuring simplicity and usability. Our goal is to allow for a responsible and safe consumption of the resources water and energy, without sacrificing on performance or design. Be a pioneer and care about the environment while enjoying your bathroom experience with our products. We offer a complete bespoke Kitchen and Bathroom Design Supply and Install Service taking away the stress to find your own installers. We take care of your full project with a dedicated project manager to assist you to make choices and ensure your project is completed to perfection. At Drummonds, we have a passion for bathrooms; with classic style & quality at our core. Founded in England in 1988 by Drummond Shaw, each unique product is steeped in a tradition beyond its 25 years. We proudly invite you to see our displays in our flagship showroom on the King’s Road in Chelsea and boutique showroom in Notting Hill. All of Drummonds’ classic bathroom products are manufactured by us in our own factories, using largely handmade processes. This ensures a level of quality and authenticity that is unequalled anywhere else in the world. From free standing cast iron baths to the taps, showers and other brassware we manufacture using our lost wax brass casting process, we design products that are classic and stand the test of time. We also offer a complimentary bathroom layout design service tailored to your space and we will work with you to bring your ideas to life. We are proud of our high-quality customer service, both in-store and online, and our qualified sales team are happy to answer any of your bathroom related questions, from choosing the right fittings and fixtures, to working with you on your layout with our design service. Even if you’re not located near one of our stores, we ship globally with previous customers coming from as far as Australia, Dubai, Sri Lanka and Hong Kong. DECO GLAZE is Britain’s largest, most trusted manufacturer and installer of bespoke colour coated glass splashbacks and worktops. We were the first to market and remain the supplier of choice for quality, service and installation. Simply, our aim is to make British kitchens and bathrooms beautiful. With over 15 years of experience installing Kitchens and Bathrooms, our biggest commitment is to carry out a service with high quality and total customer satisfaction. From the beginning of each project, we work in partnership with the customer to develop a custom design that leads to better use of spaces. From initial consultation to the finishing touches, you can be confident that your home improvements will be a hassle-free process. We believe that diligence and attention to small details make all the difference at the end of each project, so all of our workmanship is 1 year guaranteed, fully qualified insured, efficient, very tidy and professional. Discover the many possibilities of turning your kitchen or bathroom into something special. Aston Matthews is a leading specialist retailer of contemporary and traditional bathrooms, and has been in Essex Road, Islington since 1823. Pop into either our Essex Road, Islington or Chertsey Street, Guildford Showrooms to discover a vast range of inspirational and exclusive designs - with over 2000 lines in stock and on display! You can also purchase online at www.astonmatthews.co.uk and arrange a home delivery at your convenience. We offer the widest range of new cast iron baths as well as traditional and contemporary basins, WCs, shower trays and enclosures, taps and accessories, all sold under the Astonian banner. We promise to beat any competitor's quote on a like-for-like basis! We look forward to helping you create a unique bathroom. 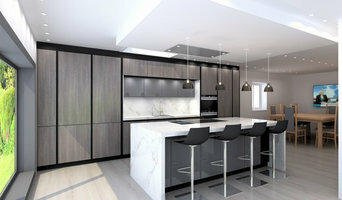 Modum Worktops specialise in designing, manufacturing & installation of handmade bespoke worktops, splash-backs, tabletops, vanity units sky is the limit. We have dedicated team of carpenters plasterers, electricians, plumbers to help with any of your ideas. We provide a comprehensive service of design and supply on all our kitchens and bathrooms. Our specially trained designers carry out a free planning and design service. They can show you how to make the most of your space and come up with a design which not only suits all of your requirements but also, of course, your finances. Oliver Talbot redefines design aesthetics and luxury, presenting you with unique and elegant interior design solutions. Oliver Talbot offers bespoke design solutions which satisfy all the demands of visual elegance and unparalleled convenience. Precision and accuracy forms the core of our interior and furniture design, as our experts devote themselves to create distinctive and graceful fixtures and furniture which are a unique interpretation of exclusive and classy creation and representation. Oliver Talbot has expertise for enhancing architectural spaces, in terms of exquisiteness and functionality, while offering premium quality and technical perfection. BLANCO has over 90 years of experience producing industry leading kitchen products including stainless steel, composite and ceramic sinks, matching mixer taps, ceramic and induction hobs, cooker hoods, waste systems and lighting. Having sold over 50 million sinks, we are one of the most successful manufacturers in the world offering the highest quality, functionality, aesthetics and professionalism. We are continuously expanding our focus and developing new products to suit a growing number of trends. From the sleek STEELART range to our traditional Belfast sink, our products are well suited to traditional Farmhouse style kitchens as well as contemporary, modern designs. Beyond our range of sinks, we have been successfully manufacturing award winning kitchen taps and water filter taps for many years, both of which are extensively tested and certified for hygiene safety. At Splashback.co.uk, we’ve created an exciting range of Laura Ashley branded and 30 of the most popular colours of glass splashbacks, all available in a full range of sizes to ensure a perfect fit in your kitchen. Our splashbacks all have self adhesive backing, so professional installation is not required, it's as easy as peel, stick and seal. We supply exclusive and trend-setting type of kitchen sinks and taps, manufactured in Europe to socially, ethically and environmentally responsible standards. If you're looking for something different and exclusive in your kitchen, we are the supplier for you! 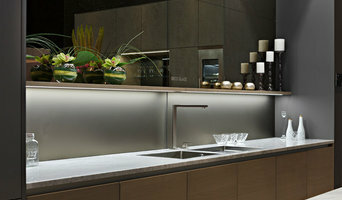 Established in 1997 and now one of London’s finest bathroom and kitchen retailers. Located in the heart of the West End, our showroom is a ‘treasure trove’ of the latest in bathroom and kitchen products from leading manufacturers such as Villeroy & Boch, Duravit, Dornbracht, Siemens, Miele & Hyde Park German Kitchens. For people with discerning taste in high quality, practical bathrooms and kitchens, a visit to Hyde Park Bathrooms & Kitchens is a must. You can view numerous displays of bathroom and kitchen products including working models of whirlpool baths & steam units as well as our comprehensive range of tiles. We have exclusive access to unique products in the bathroom and kitchen industry such as Rexa, Cea and Maier to name a few. We are also certified exclusive suppliers of the Endless Pool excercise swimming pools. We offer our clients a complete Turn-Key Service. We understand that it can be very difficult for customers to firstly visualise the design, then choose the right products and finally arrange installation. As part of our Project Management Service, we work for you to make the whole process simpler and ease the stress by working with you from concept to completion. Once you have agreed a design and specification, the installation service is arranged for you via an approved specialist installation team. WC ONE are a family owned business, established in 1988, professional and passionate ever since. We provide a tailored design service, supplying and installing bespoke luxury Bathrooms and Kitchens across the South East. We offer carefully selected premium brands for complete Bathrooms and Kitchens, such as Villeroy & Boch, Matki, Nolte & Miele. Come and visit one of our showrooms in Blackheath, Bromley and Shad Thames, where you find on display our wide selection of styles, from traditional to modern designs, to help inspire your dream project. The WC ONE bathroom is as invigorating and life-affirming as the first room we use each morning, and a haven of tranquillity in which to unwind in after busy days. With ergonomics and functionality at the core of the WC ONE design, the kitchen is no longer just a room for preparing and cooking food, it is for conversation, contemplation and where life’s important decisions are made. The WC ONE kitchen is the hub of the home. Your WC ONE experience is tailored to you, let our talented design team help you to realise your vision and create the perfect Bathroom or Kitchen for you. What should I hire an Uxbridge, Greater London kitchen and bathroom fixtures specialist for? Whether you are doing up a house you’ve moved into or you want to update your bathroom suite or fitted kitchen, working with an Uxbridge, Greater London kitchen and bathroom fixtures specialist will be extremely helpful. Even if you want to source your own fitted kitchens and bathroom fittings from bathroom and kitchen showrooms, unless you are a skilled craftsman someone will have had to make the fixtures and unless you are a plumber you’ll probably need some help with installation! On Houzz you can find kitchen suppliers, manufacturers and installers of fixtures and fittings in Uxbridge, Greater London to help with all aspects of the process. In the kitchen you can change more than just the sink and taps. Even without ripping out all the fitted kitchen units, you can still have bespoke kitchen doors made to replace the old ones and worktops laid over old surfaces or replacing them entirely. Instant boiling water taps, waste disposal units and induction hobs are just some of the gadgetry and convenient fixtures that are available for fitted kitchens from kitchen showrooms and suppliers. 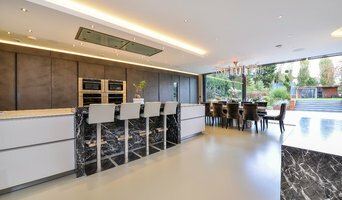 Take a look at the Uxbridge, Greater London kitchen suppliers listed on Houzz to find out the sort of fixtures and fittings they offer. A bathroom isn’t a bathroom without its plumbing fixtures and good bathroom fixtures can make or break a home when it comes to selling potential. Take time to pick out bathroom fittings that work together; you can opt for a whole bathroom suite from a bathroom showroom or bathroom installer, but if you don’t want the overly matching look, an Uxbridge, Greater London bathroom fittings specialist can help you choose individual but complementary pieces. Power shower installation can boost the appeal of your bathroom (no one likes a weak shower) and extra special features like his and hers sinks, shower body jets and roll top baths will give your bathroom style that added oompf. If you can’t stretch to extravagant bathroom fixtures you can still talk to a fixtures specialist about electric shower installation or installing a new toilet; it may seem like a lot of hassle at first, but when you leave it to a professional, all the hassle is taken off your hands. Many Uxbridge, Greater London kitchen and bathroom designers will install or offer help with your fitted kitchens, bathroom fittings and fixtures, so if you want an all-in-one renovation service, you can contact these professionals on Houzz as well. Talk to kitchen showrooms, suppliers and bathroom stores to see if they offer their own installation service or can recommend a local Uxbridge, Greater London installer for you. Here are some related professionals and vendors to complement the work of kitchen & bath fixtures: Kitchen & Bathroom Designers, Kitchen & Bathroom Fitters, Interior Designers, Cabinet Makers. Find kitchen or bathroom fixtures and fittings manufacturers on Houzz. Check out Uxbridge, Greater London fitted kitchen showrooms and bathroom fittings installers on Houzz. You can also look through project photos provided by Uxbridge, Greater London kitchen suppliers, bathroom renovators, showrooms and designers to find fixtures you like and contact the professional who installed them.